Recently Facebook rolls out shared photo albums feature to its users, a nice feature which allows multiple Facebook users to share photos to the same album. Till now only you will post the images on your Facebook profile and share them with your friends. With this new Shared Photo Album feature you can add multiple uses as the contributor on your shared album and all of them will share photos, view and edit photos in the album. The new feature rolling out to English-speaking users but very soon it will be available around the world. The feature works like the same Facebook Group, in which group members can share information, post and comments. Once you created the Shared album on your Facebook profile page you can add up to 50 other Facebook friend you want contributing to the album. All those contributor can add photos on shared album and able to view all the shared photos. 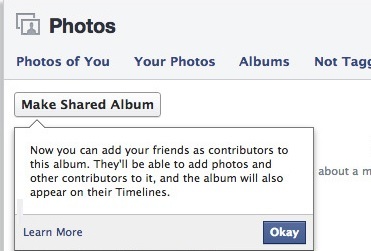 So lets take a look how this feature works on Facebook and how to create shared photo albums on Facebook. Login to your Facebook page and go to your profile page and click on the Photos section from your profile to get started. Here you will all your albums that you created, open any of your album and now you will see the Make Shared Album option in the top left corner. If you want to create the new album, you’ll have to add at least one photo before to make it Share album. Once you created the shared album, now you will add you friend as contributor to share photos on your album. Choose contributors and select an audience and Click Save. Now you Sahred photo album is now live and contributors will received the message that you created a shared Photo album. 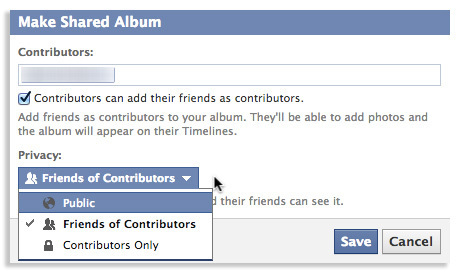 You can add 50 as contributor to your album. Each person can upload 200 photos for a maximum of 10,000 images in a single shared album. Remember some points, when you add contributor on your shared album all the pictures they share on your album or you share on that album is visible to all your contributors and their friends may be able to view the album as well. So don’t forget to use the Privacy feature of Facebook shared albums, All you have to set the privacy level for the shared album. You’re given three options: public, friends of contributors, and contributors only. So let me know how many of you able to see the Shared album feature on Facebook? Share with us in the comments below.